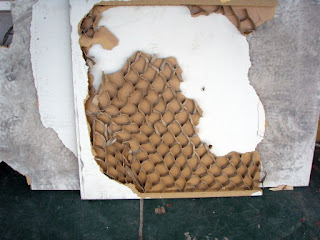 I have been a bit errant about writing my blog but it does seem to have been busy. Thursday night - out with Val and Jim to San Marco and Friday there were 3 rugby games although I only watched 2. The Hurricanes played pretty well but were beaten by the Crusaders who are having a very good season. Then The Force just can't win at home - they looked very dejected at the end of the game. 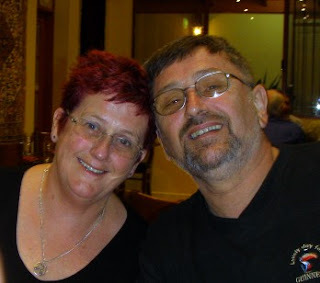 We didn't go live - we went to Bruce and Kazuko's - just as well. Saturday we watched another 2 games so lots of rugby this weekend. Jessica came over from Sydney for the weekend - the Jack Johnson concert was at our park so we had a family bbq plus a couple at home. In the end they decided listening to Jack Johnson on the Sonos was a better idea. Today we have been lazy although the April newsletter is ready to go - amazing! and I have been playing around making easy peesy silk paper - I have created a kit and having fun making papers from gummy silk noils and gummy throwsters waste. 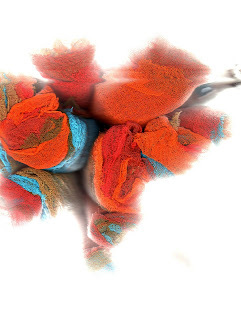 This is not the silk paper known mostly nowadays as silk fusion (because you are fusing it with a textile medium - aka a glue) but using the silk fibres which have the gum still in them - applying colour (I have used Starburst Stains) or just water and ironing the fibres makes a paper. More a paper than a fabric so another thing really. I have been punching shapes and reapplying and also adding scrim and metallic flakes. It is nice to stitch onto as well. As well as that I am working pretty furiously to finishing my entry for Stitched and Bound. Hope to have that pretty well done tomorrow. 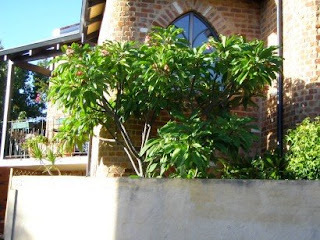 Daylight saving ran out this morning and at 5.30 it is getting dark so we will lose our lovely long nights pretty fast - we have been sitting out until quite late for along time - sometimes not eating until after 9pm. Love the long evenings. 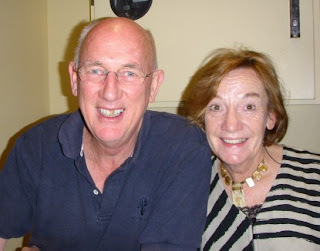 The other night it was Eva and Malachy's wedding anniversary and we went to Gogo's for a great Indian meal. This is the best Indian restaurant in Perth and some of you know that we have a very favourite Indian restaurant in Darling Harbour called Zaaffran - well both chefs went to the same cooking school in Bombay. Must have been a great school becasue we love the food at both. We took Pokey and John Bolton to Zaaffran's when they were in Sydney and they enjoyed it too. Anyway why would you go anywhere else in Perth when you can visit Gogo and he's a very nice guy as well. One of my favourite dishes is his eggplant dish which Frank (who is Italian) loves too - this is our little platter of food the other night. Here are Malachy and me and Ian and Eva - we had a good night. We met them in Tokoroa many years ago when we were teaching there and we all moved here. 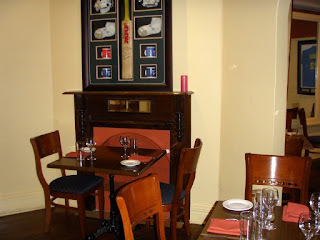 Gogo is mad on cricket and has cricket stuff all over the walls - he cooks for the cricket teams when they come to Perth. Here is some of the paraphernalia on the wall. He is trying to set up an Indian tapas bar next door where there is currently a disused premise which used to hold snooker and stuff. However the Town of Vincent have knocked it back twice with no proper reasons. Seems there are different rules for different players. 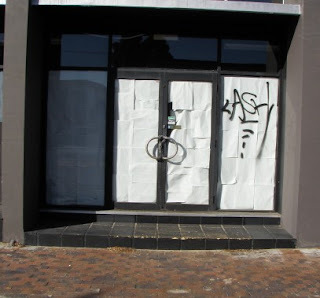 They are on all the time about Beaufort Street being a great eating mecca etc but it would seem they would prefer a run-down rubbishy place unused and derelict to just sit there to a fantastic eatery where we would like to be able to go. Studios magazine has just arrived at 5pm so there's tomorrow morning's job all organised. I think they are pretty-well all presold somehow. This is my studio page - and when I find the camera I will take the same shot tomorrow - I think the pristine part has gone. I had no idea what photos went as Bruce took 100s and then he and Ian sat at the computer and laughed at all the ones of me. I am pleased not to smiling since I always muff it but this is more like what I do , head down, probably bum up, busy at work. 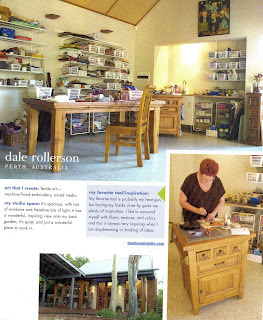 And I am thrilled that the outside of the studio made it in - gives it a special Aussie flavour as there isn't anyone else included from down under. My working table is fabulous - it's one of those kitchen thingies with a marble top - very suitable for heat guns etc and paint etc and I just pop an old towel over it and iron on it as well. Al l my tools and stuff fit nicely in the drawers and cupboards which open both sides. It was a good buy. ps yes I am very lucky indeed to have such a wonderful studio - it makes our outdoor living area just that much more wonderful and the whole area is a super place to relax in after a hard Thread Studio day. 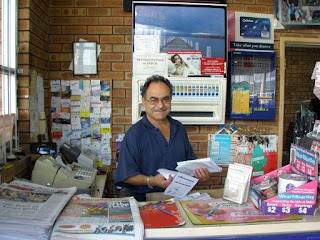 Here is Frank sorting out his accounts at the garage just down on the corner. If Frank ever goes, who will fix our cars? All the other garages around just sell petrol and lollies. 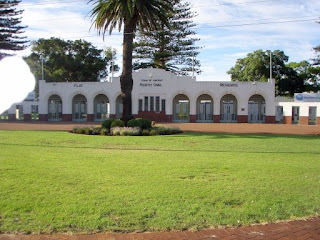 Can't create a break between the 2 pics but this is the Perth Oval down on our corner - where Jack Johnson will be singing this Saturday. Very close to home. I am trying to look at my environ with new eyes. Everything is familiar - I have roamed often but you do keep seeing new things. 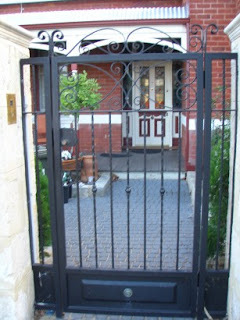 I had a couple more fabulous doors arrive today - doesn't it make you want to travel? 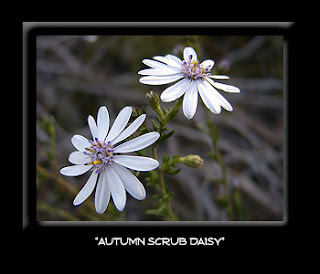 Mandy sent this one she photographed in Dublin - some of the dry places in Australia would die for that greenery. Shirley sent me this one from Cusco in Peru. The last day of the Easter break has gone and I have spent it counting threads, ordering and packaging mostly, although I did get a tiny bit of work done and Ian did do some work in the garden making the sprinklers go further on his lawn. 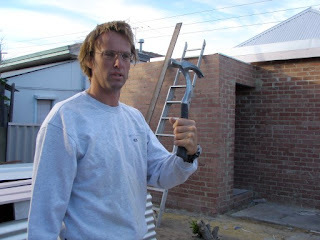 Now that it is cooler in the mornings and evenings we will be able to do more gardening. 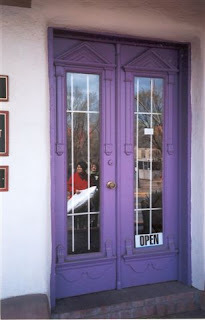 Shirley sent me this wonderful purple door - isn't the colour magnificent? It's of the Canyon Road Gallery at Santa Fe New Mexico which she says is a great place for art galleries.This purple would entice me in. I am very fond of this colour although I haven't worn it or worked with it for years. When we were teaching in Tokoroa we had a bed head (just like the one in Rosemary's Baby) which I painted purple. 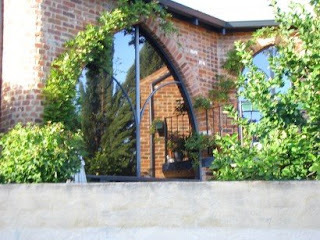 Then I popped down the laneway near Grant's where I revisited this fantastic house all tucked away - I photographed their door for my doors but I now see that all their windows and door are in this same shape. You would never know this house is there. 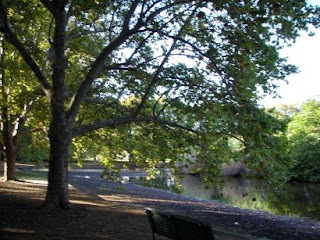 This is Hyde Park - yes we have our own in Perth - we go walking around it regularly and this morning people were having bbqs (at 7am) . These days the water level is pretty low but it is still frequented by lots of walkers, ducks and the like - very busy park. 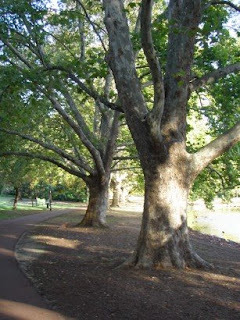 Very European with Oak trees and stuff. 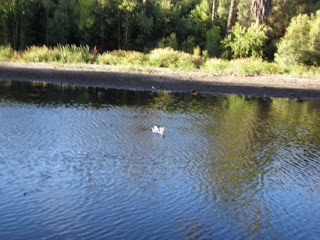 Believe it of not - this is a pelican - you can see photography was not my best subject at school. On the way back I passed this house with a great door and gate - there are quite a number of interesting gates around here. What a response to the scrim bundles. Because I got lots of orders I had to cut and roll all of them. 8 different lots. Ian is waiting for the battery to recharge and will photograph them in the morning and you will be able to see them in the catalogue in Fab Bits under Natural Bits. He has been busy doing other things like tarting up the Hand threads department today so the Wild Women Challenge is still to come. Still nice and quiet around and about but they will all come home tomorrow. I have been stocktaking and working on the embellisher as well as cutting and rolling. Hope everyone is having a nice relaxing Easter break. We are working away albeit it in a relaxing manner - watching the rugby, working on the web, packaging stuff, writing, reading and stuff. I have been rolling up scrim bundles in themes - Australiana and Opulent. They look great but I doubt if they will make it to the web as I only have 12 of each colour set. 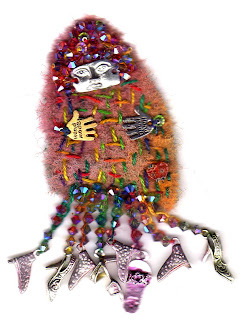 These are the Kimberley Dreaming bundles. 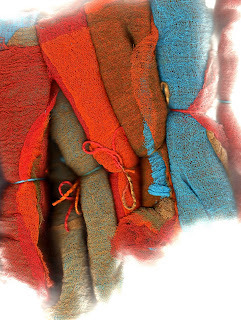 I just thought they would be especially good if you were using scrim and wool on the embellisher - mainly because that is how I have been working with my Marrakech fabrics. The weather is still very warm. I have started on my Marrakech entry for Stitched and Bound with a few ideas roaming around in the head. Finished a Wild Woman - I thought it highly appropriate to have shoes since I seem to have lots of pairs myself. Visit our website tomorrow to see what the challenge is all about. Off to get ready for our bbq - Bruce and Kaz are coming around but not sure where Grant is - he went up to Dongara to kite surf. Yes I have been awol for a few days. On Monday we were just so busy that I didn't even manage to get to Embroidery in the afternoon. Everyone must have been buying up large before Easter. 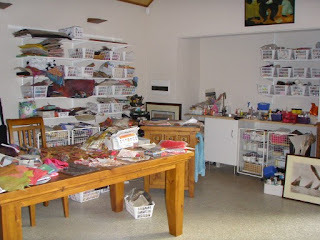 And on Tuesday and Wednesday I went with a few goodies to the WA Quilters monthly meetings. I haven't been out and about with goodies like this for a long time and I must have agreed when they asked me in a weak moment. It is not really worth it although it is nice to catch up with people and have a chat but we really can't afford the time. So creatively - here I am down the shute. I did almost finish a Wild Woman though - just her shoes to pop on then I can get the WW Challenge on the road. 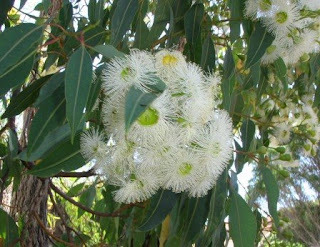 Here are a couple of pics of the Eucalyptus in flower just outside the window in the front garden - when I am at the computer reading, deleting and answering emails, I can see the birds as busy as can be out in this tree. 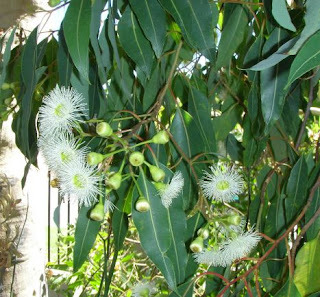 I never know the real names of the trees (biology and botany were never my thing) but it's a lovely time of the year when they flower. Right now the light is shining through the tree and making magnificent shadows. 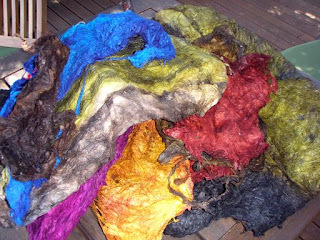 We have just had a huge shipment of gummy silk cocoon strippings and gummy silk waste and Jacinta has dyed some up for me - this is a super pile of "sheets" - not sure how I will sell them - maybe by weight - but they will be fabulous for working into. 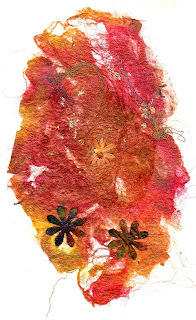 I am putting together a kit using the fibres which will be ready for my next newsletter (yes April is creeping up) but this is easy peasy silk paper - no textile medium required. 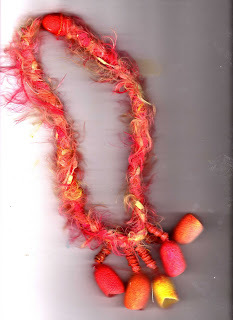 This one Jacinta has laid the fibres out and dyed them in Ironbark. it looks so fab in the real. 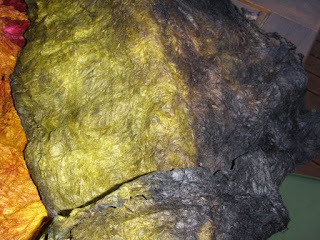 What I have been doing is laying out the fibres and spraying with Moonshadow and friends - ironing it makes your paper. What am I reading? I am a prolific reader and always seem to have a stack of books on the go. 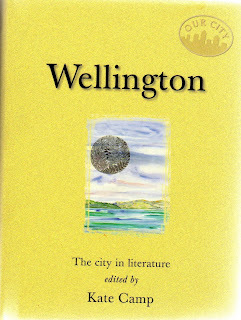 Apart from Contemporary Knitting (Ruth Lee) which I pick up just before lights out, I am also enjoying these 4 - first one is writings about Wellington which I picked up in NZ last time I was over. 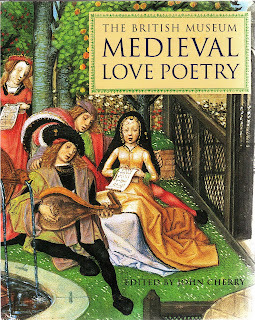 This is a lovely anthology of Medieval Love Poetry I found at the British Museum last year. 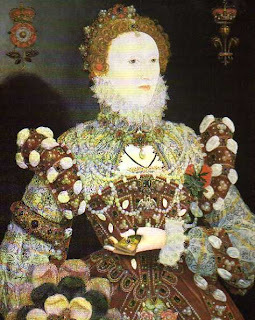 you can see I enjoy the Medieval and Elizabethan periods. This is another little gem I like to pick up and read a bit and absorb a bit - I saw someone reading it on the underground one time when we were in London and bought it at the next bookshop. Full of all sorts of interesting information about the real people of the time. 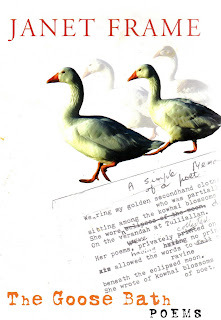 I am not a mad poetry reader but always love Janet Frame so I just delve in and out. 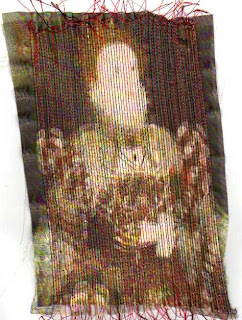 Still working on the pintucking - don't expect a pristine piece as you have to remember that Elizabeth 1 lived a long time ago. 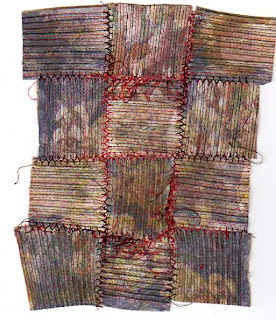 Somehow I told Cherry last night that I would enter a piece in Stitched and Bound - by the 3rd April. Sometimes I think I am crazy..... It's going to be Marrakesh based. Bit of a lazy weekend watching rugby and relaxing - well - counting stock and winding threads and sorting as well would be better. Ian's 'old' team lost yesterday - The Force had a very good win in Auckland so of course he has mysteriously gone back to his roots and the Crusaders. Talk about a turncoat. If you are seriously loyal you stick with your team through thick and thin. Another version which you can see is clearer and not in reverse. 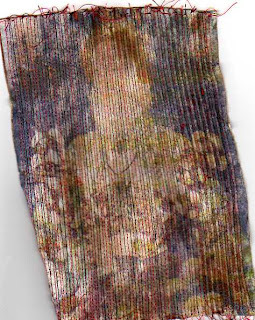 This one was using the Jacquard pre-treated cotton but maybe if your piece was old and jaded and worn out it might be more like the first one. Then I have cut it up and rejoined it. I would like to think that it could be seen as recycling? In preparation for the next stage I have twin-needled some red velvet - which Rae had dyed - Kiss-me. Appropriate? I have been working away further on pintucks and managed to break 2 twin needles - tut tut - teach me for being in such a hurry. 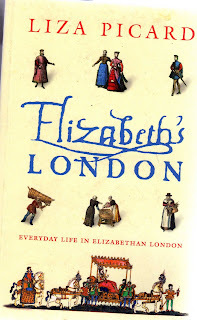 I am twin needling over Elizabeth 1st then I shall cut her up and join her back together. Should have some pics tomorrow if I get it finished. 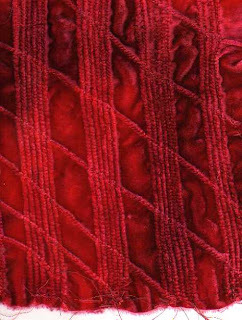 Also some twin needled red velvet - I have an idea for a bag. Watch this space. Really good rugby tonight - The Hurricanes beat the Brumbies in Canberra - 33-15. (Sorry to my 'Canberrean' readers - well not really) but the 'Canes finally played liked they can. This is Shannon Paku getting one of the tries. Wasn't yesterday a great door day? 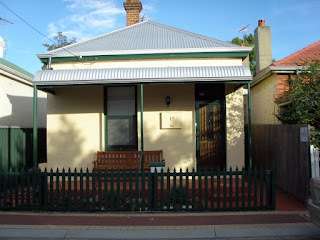 I have been to visit lots of doors - very enjoyable and a special thanks to Frank and Elizabeth for organising it. 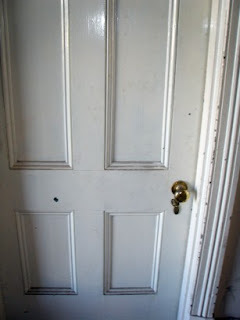 Thanks for all the comments on my blog - I have here a photo of my door from the inside - there is a panel on the left the same as on the right. I am not sure if it is an original - it was here when we came. 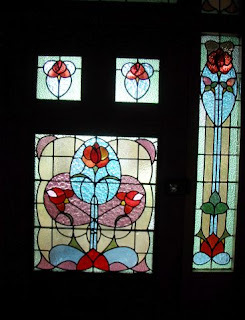 We do have another 2 inside doors with lovely leadlight as well. Our lock up - well that's what we call it - but it is our little warehouse where we store lots of our stock - long and narrow but full to bust. Nobody locked up inside though. 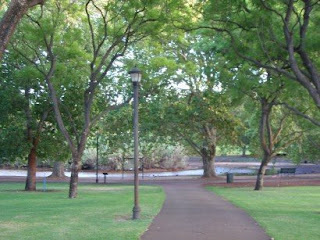 I am thinking I will take a walk around my environs and capture some different feature to post on the blog. Tonight we are off to the ACO for another good concert. Today I have been out and about photographing doors in my neighbourhood. 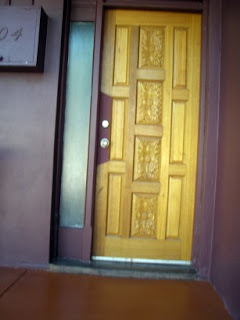 The thing about doors is you always wonder what goes on behind the door. 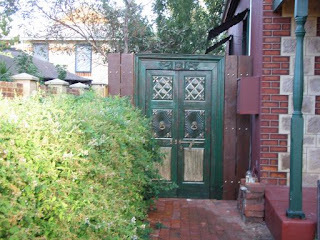 Do you remember the song 'The Green Door'? 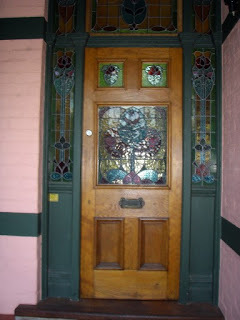 This one is our front door which has glorious lead light. Below is a gym just around the corner which went bust. 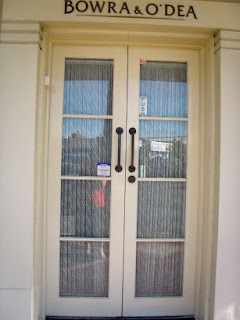 Not sure why they have pasted white paper inside the doors as there is nothing inside. And a graffiti artist has popped by to add his/her tag. 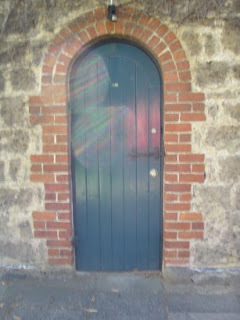 This strange looking door is the door to our lockup. 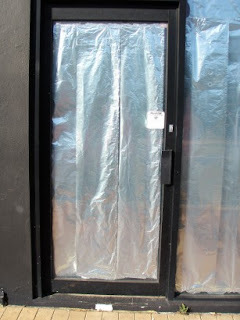 We wanted to keep the sun out and also create some more storage space so we taped tin foil to the glass. It works a treat if hardly salubrious! Next I found an art deco building - home of a funeral parlour. Lots of interesting things going on behind there for sure. Called around to Grant's and this is the door to his bedroom - his house is making great progress.Nothing much behind this door at present though, apart from spare boards and paint tins. 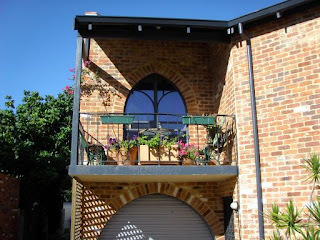 Went down the lane behind his house and found some little gems - this is a lovely arched door on a balcony. Haven't been there before. Perth (well, around our area) has lots of interesting little lane ways - they were originally for the nightwatchman to call and collect. 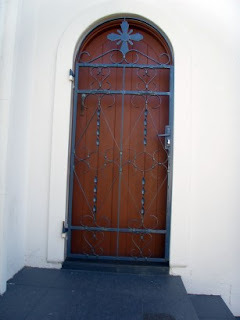 The door at the local church - this style of brickwork we have on our back door area too. Then off to the Luxe Bar - I am not likely to find out what goes on behind this door but it is pretty busy at night and huge queues wait to get in. 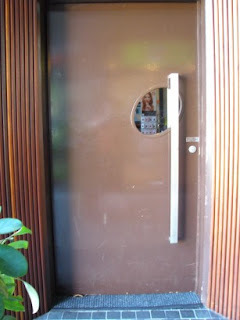 The door at Lincoln's Cafe near us where we like to go for coffee. The Greek Orthodox church just up the road. Finally, just down from us is an old police station , used for road safety and stuff but now most of it seems to be a giant car park for police to leave their cars. Means there are always police around the area. 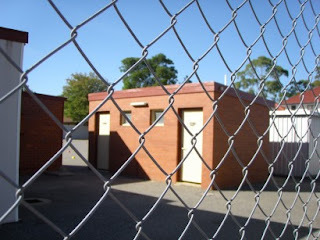 This is the ladies and gents so we should know what goes on behind these 2 doors! Do go and visit lots of other doors today. 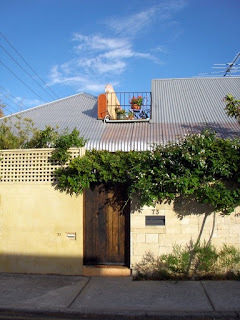 Pop over to Elizabeth's site - The House in Marrakesh in my links and you will see her doors and then to Frank's in Mexico - I tried to load the list but I lost this post 3 times so have given up!